The April Bowling Tournament is back. Please see the link for more information and register today to attend. The Spring Fling Golf outing at Echo Valley Country Club is May 9th at 1:00 PM. Get your team together and register online. For more information see the flyer. The 2019 IMPACT conference will be held April 8-9 in Saint Paul, Minnesota, and will be co-located with the Green Schools Conference & Expo (GSCE), the largest annual event for green school advocates in the U.S. The event will feature two days of conference programing and tours, kicking off with a welcome reception at the Science Museum of Minnesota. The conference will also feature a keynote from Zaria Forman, a world-renowned artist known for her pastel depictions of climate change. ASHRAE Wisconsin Chapter is hosting CRC on May 2-4, 2019. Event registration is now open. Head to crcmke.org to sign up now. See the post to the right for the latest Chapter meetings and don’t forget to register for the events as they become available. Come out and support your local ASHRAE Chapter by attending regular meetings. If you are planning to donate to research promotion this year, please consider applying your contribution specifically to the Iowa Chapter Endowment fund so that the donations contribute to local projects. The latest IowaStalks will be posted for your personal enjoyment. Check it out! Check out our meeting posts and calendar events to the right and browse the calendar below to keep up to date on your Chapter happenings. 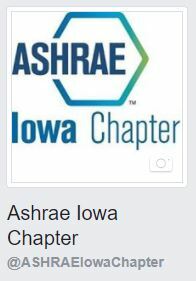 If you would like to subscribe to the ASHRAE Iowa Google calendar, look up the calendar with the ashraeiowa@gmail.com email address. If you click on one of the events and then “copy to my calendar”, it will add it to your GOOGLE calendar. This (page, web site, discussion group, etc.) site is maintained by the Iowa Chapter of ASHRAE. It does not present official positions of the Society nor reflect Society policy. The Iowa Chapter may not act for the Society and the information presented here has not had Society review. To learn more about ASHRAE activities on an international level, contact the ASHRAE home page at http://www.ashrae.org.